Promotion Extended: $649 Contractor Special on GE GeoSpring Heat Pump Water Heaters. Valid On All Orders* Placed Between July 29 and December 15, 2014. Ecotone Products has good news about the recently expired GE GeoSpring instant rebate promotion. The promotion has been recently renewed. 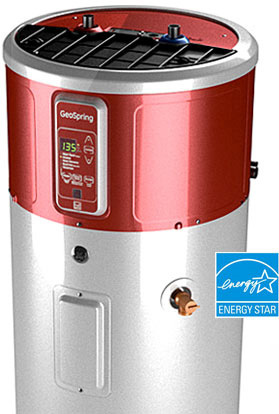 Courtesy of the Northwest Energy Efficiency Alliance we are able to offer an instant $300 rebate on all GE GeoSpring water heaters purchased from Ecotone Products between July 29 and December 15, 2014 (while supplies last). The promotional price (after rebates) for contractor purchases is $649. Plus free shipping is available on all GE GeoSpring units delivered within the Portland metro area. Free shipping is also included with orders of 3 or more GE GeoSpring water heaters for normal deliveries anywhere in the Pacific Northwest. Terms and conditions apply. GE GeoSpring models are available in red (GEH50DEEDSR) and gray (GEH50DEEDSC). To learn more, or place an order for GE GeoSpring water heaters email Ecotone Products or call us at 503-907-2901. •Qualifies for state and local utility rebates and tax credits. •50 gallon capacity, which makes it easy to replace a 40- or 50-gallon standard electric water heater. •Provides the same amount of hot water as a standard electric 50-gallon water heater. •Uses the same water & electrical connections as current electric water heater. •Designed for common indoor installation in areas such as: basement, garage, closet, utility room, attic, etc. •Exceeds ENERGY STAR® standards of 0.88 Energy Factor (EF). •Has 5 operating modes, including a vacation setting, for optimal energy savings & water heater performance. •Electronic controls makes it simple to change the temperature or operating mode. •10 year limited warranty*** on all parts. * Ecotone Products’ terms and conditions apply. Offer valid while supplies lasts.